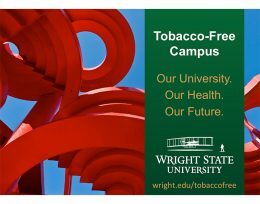 In one month, Wright State University will become a tobacco-free campus, joining over 1,400 other colleges and universities in the U.S. that have chosen to become tobacco free. The new tobacco-free policy, which takes effect July 1, will help promote a healthy environment in which students, staff, faculty and others can learn, work, live and visit. To that end, the university is partnering with Public Health—Dayton and Montgomery County and WCORHA WELLScript to continue to offer free tobacco cessation classes for faculty, staff and students at the Dayton and Lake campuses. A five-week tobacco cessation course will be held June 1, 8, 15, 22 and 29 from 4–5 p.m. in the Employee Health and Wellness Center, 111B Medical Sciences building. A group tobacco cessation class will be offered on Thursdays, from 5–6 p.m. beginning June 8 in 152 Dwyer Hall. The course will last for five to eight weeks, depending on group size. Participants will receive an individualized quit plan and learn about proven strategies, relapse prevention and the best nicotine replacement therapy for them. For more details or to register, contact Doug Newton at doug.newton@wright.edu or 937-775-5256. “In the first offerings of these cessation classes earlier this year, several employees and students successfully completed the program,” Newton said. Wright State began investigating this initiative five years ago with a task force comprised of faculty, staff and students, as well as Public Health – Dayton and Montgomery County. After careful review, many surveys and campus discussions, the decision was made to become a tobacco-free campus. Beginning July 1, all smoking and smokeless tobacco products, as well as e-cigarettes, will be prohibited in all university facilities, on university-owned or leased grounds, and in university residence halls and apartments. However, nicotine-replacement gum, lozenges and patches, as well as other cessation products approved by the U.S. Food and Drug Administration will be permitted.